Signs of the winter abound. The rains have returned and glimpses of the white-capped North Shore mountains loom from behind the clouds. There are also many white-capped creatures that have returned to Stanley Park during this dark and wet time of year. 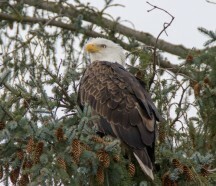 During the winter season, Vancouver’s resident bald eagles return from their summer voyages to the northern and interior reaches of the continent. Between December and the end of February, courtship begins between returning mated pairs. Bald eagles perform elaborate courtship displays that involve aerial acrobatics, chases and long calls that penetrate the forests of Stanley Park. It’s also at this time of the year that pairs begin mending last year’s nests. Each nest is repaired and added to annually which, over the average eagle’s lifespan of 20 years, can result in the creation of the largest nests of any bird in North America – the size of a VW beetle. So as you’re watching the signs of the winter season go by, make sure to listen for the cries of the bald eagles that have returned to their foggy tree top homes in Stanley Park. If you are looking for a Christmas present to the bird lover in your life while supporting the conservation of bald eagles, consider SPES’ Adopt an Eagle Nest program. The adopt package includes a charitable tax receipt, an official certificate of adoption, information about local eagles and their nests and an invitation to attend a special Discovery Walk to see eagles in Stanley Park. You can find more information here.